An entertaining read with “100 dirty little money-grubbing secrets” that will A) Get you thrown in jail B) Chased out of numerous establishments and/or C) Result in you being slapped by more than a few women, there are some frugal nuggets in Secrets of a Stingy Scoundrel by Phil Villarreal, which is a quick read despite its 242-page heft. Tongue-in-cheek, while aimed at young men with no conscience, folks of all genders and ages can find words of wisdom — or learn what NOT to do. Some “secrets” are so out-there, even Villarreal admits to not having done them himself, instead passing off the idea on a number of buddies. This results in a number of entertaining personal anecdotes. Sometimes his seemingly wacky allegories make excellent points. My favorite is the mini-chapter called “The Pacman Effect,” where he uses the little yellow video game character to say “there’s no such thing as too much of a good thing.” Pacman eats up everything in his way — whether power pellets for 10 points, or the strawberries or cherries for 1,000, they’re all fair game. The same goes for picking up coins off the street, Villarreal says — why pass up free money? Even though it’s small change, eventually it will add up over time, right? Then there’s the “Don’t Smoke” chapter, which is pretty much a no-brainer. If you don’t smoke, you don’t spend money on cigarettes (unless you bum them all from other people). Mr. Saver, how about quitting? Those cancer sticks are not only bad for you, they’re EXPENSIVE! 24. Cut the Cord: Villarreal doesn’t think cell phones are a great deal, but he doesn’t want to miss another opportunity to interview a big star like Quentin Tarentino. So he sprung for a cell phone and canceled his landline. 35. Show Me the Money: In a nutshell, threaten to back out of signing a car or home loan unless the loan officer gives you $20. It’s such a ridiculous request when you’re usually receiving a large loan, that the financial guy will toss you a $20 just to “save” the loan. 71. Pound Your Dog: If your dog gets sick and you can’t/don’t want to pay a vet bill, “abandon” the pooch at a no-kill shelter (in a disguise, of course). After the staff has nursed him back to health, show up sans disguise and describe the exact pup you’re looking to adopt — the description will match YOUR dog, of course. 74. Bar-keep: Swipe some cash off the bar without the bartender or other patrons noticing. Sounds like a recipe for disaster. 94. Now Boarding for the Departed: Want to fly cheaply without having to book your flight far in advance? Head to the airport ticketing counter and beg for a discounted fare because you’re on your way to a funeral. Apparently, airlines keep this discount secret. You just have to make up a fictional death in the family, and stick to the story. All in all, the book was highly entertaining, but I wonder about its shelf life, with mentions of particular companies like AOL, Best Buy and Suncoast (are there any of those here on the East Coast anymore)? It also felt slightly forced when Villarreal mentions Consumerist.com, which he rightly discloses as a freelance employer — and then mentions another time or two in subsequent chapters. 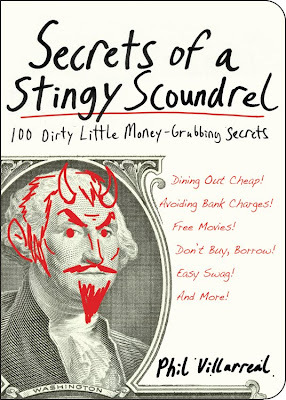 While Secrets of a Stingy Scoundrel: 100 Dirty Little Money-Grubbing Secrets does have 100 ways to save money, I’d rather stick to my tried-and-true, ethical methods, thanks. @Red: That is true, but the way the economy is going, who knows how long it will last. Their competitor, Circuit City, went out, so I don't have much faith. Best Buy is still on the east coast. We have one 20 minutes away.